Okay, bananas. I couldn’t eat them. I could pick one up, peel it, however, I simply couldn’t get it to within an inch of my lips! The thing would make me wretch! And on the very rare occasion I actually got the smallest of morsels into my mouth, well, projectile vomiting was always on the cards! Since childhood though, I’ve been adamant that I would conquer the banana! And I almost did. Around three years ago, I managed to eat a whole banana! I simply went for it! I’ve absolutely no idea what changed but once chewing and swallowing, it was delicious! From that point on I feasted for months on them! When I rode my bike, traveled to work, went out for the day, oh, anywhere, I would take a banana… Happy with bananas, who’d have ever thought it? It’s like getting up one day, being driven 200 yards in a car and not wanting to throw up! Now that would be another hurdle overcome…I have ways of dealing with that though, however, if I’m ever in your car and I ask you to pull to the side of the road, take me seriously, don’t hesitate, otherwise it’ll cost me to have your interior valeted (is that a proper word?) and fumigated! I digress… I began to suffer the most terrible bouts of nausea and stomach aches, this continued for months… To cut a long story short though (because I can hear the washing machine has finished its cycle), bananas are not good for me. My body disapproves. Maybe that’s what I was being warned against all those years ago? I just wonder, you know, a little, whether or not what follows might actually be okay? I found the following little piece here… Enjoy. Peel 5 or 6 green bananas. Use a knife if you need to. Slice them into thin wedges or strings. Heat an inch of peanut or olive oil in a large skillet. Sprinkle the fries with salt and pepper. 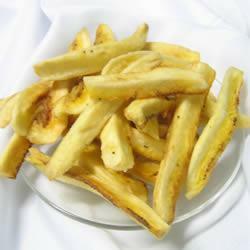 Fry until golden and drain on paper towels. Re-season if necessary and serve with ketchup. This entry was posted in My Words and tagged Banana, Fries, Motion, Sickness. Bookmark the permalink.